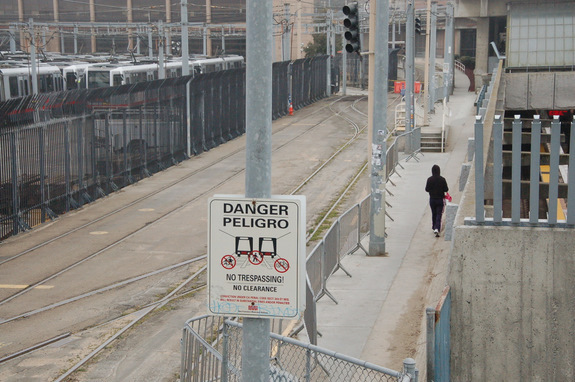 BART riders will no longer be squeezed alongside Muni tracks to get into Balboa Park Station. A new walkway connecting travelers to Ocean Avenue on the north side was unveiled Friday as one project in a host of efforts aimed at improving access to the busiest BART and Muni transit hub outside of the city’s downtown area, though it may be just a baby step in the eyes of some advocates. The walkway is a welcome improvement to commuters using the station to and from Ocean Avenue who previously had no choice but to squeeze through a narrow passage alongside trains or circumnavigate the station to get inside. Balboa Park Station serves at least 12,000 passengers per day as a key hub for BART trains as well as Muni’s J, K, and M Metro lines and seven other buses, all while doing duty as a major Muni maintenance facility. The new walkway helps link cycling commuters to the bike lanes on Ocean Avenue, which have served as a more comfortable connection to City College of San Francisco and the Ingleside district since they went in late last year. “This is definitely going to be a lot easier for me riding my bike to the station than having to go down that gravel path to the other side,” noted Jocelyn. Although the improvement helps solve some issues for BART passengers connecting to the 49 bus or other destinations north of the station, Balboa Park’s original planning seems wrought with fundamental oversights in safety and access. Pushed right up against the 280 freeway, the pedestrian-heavy area is surrounded by dangerous roads swarmed with car traffic from four nearby ramps. “Crossing Geneva, crossing San Jose, is a real challenge. You put your life in your hands,” said District 11 Supervisor John Avalos, who noted the particular difficulty for those with wheelchairs and strollers in the largely working-class neighborhood. With significant changes, the station has the potential to be the center of a neighborhood transit village. However, some advocates and city officials say it has a long way to go. Dangerous traffic conditions on the streets surrounding the station, as well as heavy industrial uses, cut it off from the rest of the area, says Radulovich, creating a “hole in the donut” of otherwise rich neighborhoods. 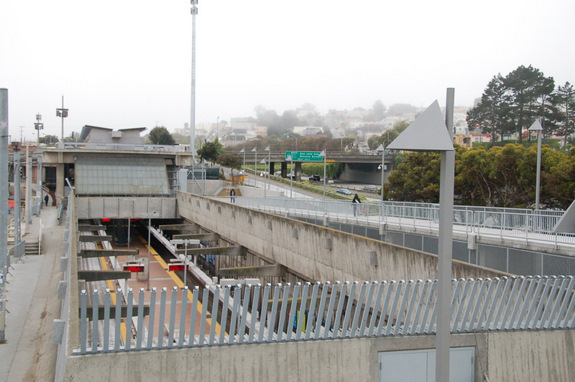 “Everyone’s crossing their fingers in different directions,” said Avalos, who highlighted that the SFMTA recognizes the station primarily as a maintenance facility, not a transit hub. “That is not the way we need to be working collaboratively on land-use issues and transit-oriented development in San Francisco,” added Avalos. Dysfunction in agency priorities and coordination seems to be the biggest obstacle to implementing the The Balboa Park Area Plan, a vision developed by the SF Planning Department in collaboration with the local community. It calls for the Balboa Park Station to become the hub of a connected, lively transit village and was adopted by the Board of Supervisors in 2009. The plan aspires to fill in the “donut” in the area by improving the quality of place around the station, illustrating ideas as bold as building a deck of buildings and public space over the freeway that would remove physical barriers and better connect the two sides it currently divides. But for now, even simple pedestrian safety improvements remain difficult to implement. At the end of the new west side walkway, there isn’t a single crosswalk on Ocean Avenue, although Radulovich said the SFMTA has funding from the Safe Routes to Transit program to install them. The next project lined up for the station is an east side walkway that would connect the Muni boarding area with the new one, which is only accessible by entering BART fare gates. Radulovich said construction on that is hoped to begin early next year. Until then, Muni riders coming from the north side must still walk the gauntlet. this kind of half-assed setup that only now is being addressed is what happens when you cut corners and go half-assed early in a project. Never let politicians’ doubletalk screw up a well designed project, or in this case, end up with a compromise that ends up as a big monument to small thinking. ahh, the joys of mid-century design… inward-focused bunker design, hiding the entrance, rejecting the street. I snapped a photo of it while it was under construction. You can see on the right hand side that there is indeed a “hidden pedestrian switchback” to the right of the photo. This is your crosswalk to get to the other side of Ocean Avenue. I hate to be the one to say it… but with the hefty price tag is there a reason they didn’t use union labor for this project? I was going to write that the switchback only gets you down to a bus stop on the 280 on-ramp below, but I had to check Google Street View first. Indeed, there is a switchback on the other side of Ocean – so you could go down and up again to get to the other side – which is hardly an inviting route. 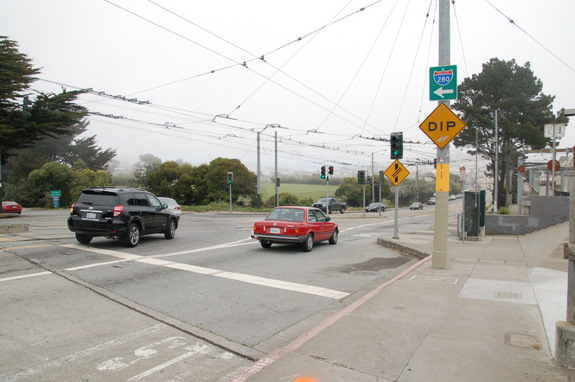 The only worse way, in my mind, to cross a street is via a pedestrian bridge – like the one bridging Ocean on the other side of the 280 (connecting Lick-Wilmerding HS and City College). People should not be pushed off the street. Nice piece and photos, Aaron. You provided constructive criticism of the project, something I missed elsewhere. Perhaps one day, the space above the Muni light rail maintenance and storage facility could be used for a housing/transit oriented development. I’m happy about the new extension, but it’s on the opposite side of which is needed the most. I’m surprised the Streetsblog article doesn’t have a picture of the Geneva and San Jose “entrance” (if it can be called that) into the station. The corridor for people to walk is 8-10 inches at it’s narrowest. While the trains are moving through, people get 1-2 inches from being hit by a LRV. I was on Geneva this morning and wanted to check it out. Much to my surprise there is no entrance on that side- just an iron gate. Who build a one-ended sidewalk? And further, it seems to be BART only. MUNI riders still walk the old crumbling path! The station area plan in the illustration is as dead as can be. The freeway deck is prohbitively expensive and Muni has intention of giving up the Upper Yard. A few small fixes are possible, such as wider sidewalks, better crosswalks and a widened boarding platform for the K, but expect this station and neighborhood to remain eyesores for decades to come. It looks like they are re-paving the cement surrounding the rails. But unless they radically change were the rails go, you can go when the paving is done and experience how terrifying it is. Google streetview doesn’t have a very good angle on it.